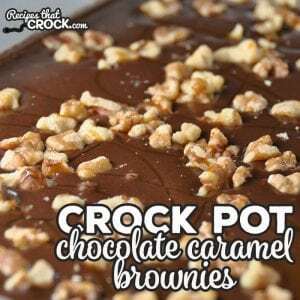 Crock Pot Chocolate Caramel Brownies - Recipes That Crock! These delicious Crock Pot Chocolate Caramel Brownies take your normal brownie to the next level! Plus, they can be made at home or on vacation! No oven needed! Just bring along your trusty crock pot! As you know, I’m the Sugar Princess around here. So when I was looking through Gooseberry Patch’s Best-Ever Cookies, Brownies and Bars and saw the original recipe that I adapted to make these Crock Pot Chocolate Caramel Brownies, I knew the Sugar Princess had to try it out and share with you good folks! Spray your Casserole Crock or 6-quart Crock Pot with cooking spray (you don’t want these babies sticking to the crock!). Mix up your brownie mix per the directions on the package, spoon into your crock and spread evenly. Drizzle just shy of a 1/2 cup of your caramel topping all over the top of your brownie mix and swirl in with a knife. Place a couple paper towels under your lid (to catch moisture), cover and cook on high for 2 – 3 hours. Let your brownies cool. Mix together your icing and remaining caramel topping in a microwave safe bowl. Heat for 45 seconds, stir and drizzle over brownies. Sprinkle on some walnuts, if desired and serve! If you don’t have a microwave handy, you can just stir up your caramel topping and icing until it is really smooth. Then spread it over the top of your cooled brownies gently. Warming it up just makes it pour more easily! 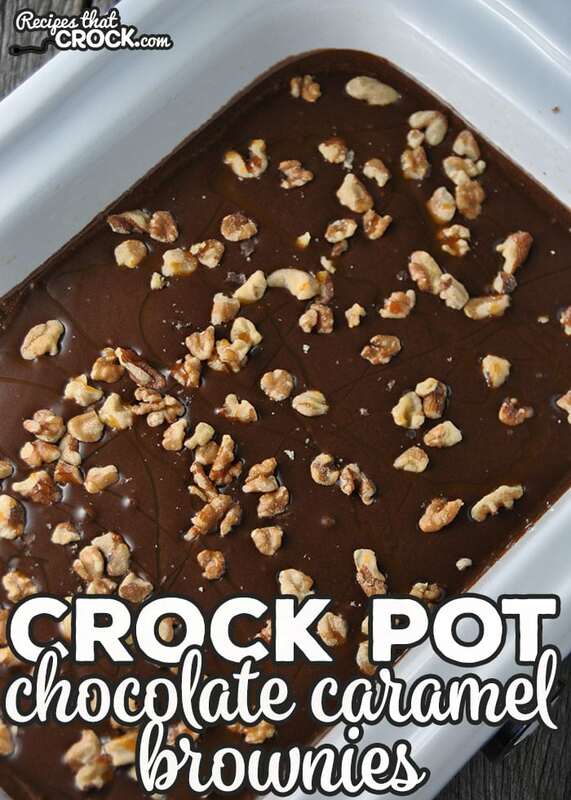 These delicious Crock Pot Chocolate Caramel Brownies take your normal brownie to the next level! Spray your Casserole Crock or 6-quart Crock Pot with cooking spray. Mix up your brownie mix per the directions on the package, spoon into your crock and spread evenly. Drizzle just shy of a 1/2 cup of your caramel topping all over the top of your brownie mix and swirl in with a knife. Place a couple paper towels under your lid (to catch moisture), cover and cook on high for 2-3 hours. Let your brownies cool. Mix together your icing and remaining caramel topping in a microwave safe bowl. Heat for 45 seconds, stir and drizzle over brownies. Sprinkle on some walnuts, if desired, and serve! If you don't have a microwave handy, you can just stir up your caramel topping and icing until it is really smooth. Then spread it over the top of your cooled brownies gently. Warming it up just makes it pour more easily!